Integrated systems combine renewable technologies in order to maximize system performance and energy savings that cannot be realized with individual systems. EEC's integrated systems utilize ground source heat pumps (GHP), solar hot water (SHW), hydronic heating and cooling, intelligent zoning for air systems, and energy and heat recovery ventilators (ERV, HRV), that are powered with renewable energy: solar photovoltaic, small wind turbines or micro-hydropower. Our designs far exceed performance of the commercially available individual components that make up these systems. We focus on the energy consumption of the total systems throughout their entire operating regime in order to reduce annual energy consumption of the complete HVAC system. Following this systems approach, EEC uses industry standard Polysun integrated systems and Geolink software to model system designs based on their coefficient of performance (COP) and seasonal performance factor (SPF). As a result, we consistently deliver GHP centric integrated systems whose COP far exceeds typical GHP installations and conventional HVAC systems. Below, we provide an overview of the design features and advanced technologies we incorporate to optimize system performance and maximize energy savings. We then provide examples of several cases of integrated system designs that have successfully been implemented. EEC's integrated system designs are specific to the unique features of every home and budget and can be incorporated into new construction and existing buildings. GHP systems operate at conditions other than full load most of the time, therefore our designs maximize partial load efficiency by using controls with variable speed pumps so as to not decrease capacity as measured by peak load performance. Distribution losses are mitigated with extensive design documentation of self-correcting and best practice technologies such as hydronic distribution, intelligent zoning, variable speed fans on water-air units, and minimizing plumbing runs on hot water distribution. We follow best practices to facilitate proper installation, commissioning and performance monitoring for the equipment utilized in our integrated systems. GHPs operate at partial loads 88% of the time in the heating mode and over 90% of the time in cooling mode. Using two stage scroll compressors, variable speed ECM fans, and intelligent zoning, EEC maximizes the performance of GHPs running at partial loads. For example, real time monitoring and control of water flow rates has been shown to increase COPs by 6.8%. Under partial load conditions, GHPs consume 60% of rated energy compared to peak load operation providing tremendous savings potential. The ideal GHP would provide maximum capacity with high performance but achieve its highest performance when operating under partial loads. This is currently not attainable with stand alone GHPs as the maximum performance of the system is realized at peak loads. However, this can be attained with integrated system design. A GHP running at maximum flow with a COP of 5.56 may result in an overall system COP of only 2.4. The highest efficiency is obtained when running the GHP at 60% of the maximum, where the COP of the GHP is 5.26 and the COP of the total system is 3.76. 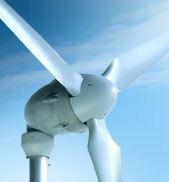 Balancing capacity with performance in this manner can provide an 11% reduction in annual energy consumption. For GHPs, hydronic heating is much more efficient than forced air heating. In forced air applications, the thermal losses from improper design and installation of ductwork can significantly decrease the COP of a water-to-air GHP. However, GHPs with advanced features and intelligent zoning can minimize losses to provide efficient and maximum comfort. EEC utilizes software to model and design zoned air systems to minimize thermal losses and install GHPs with energy efficient microprocessor controlled variable speed fan motors to offset these duct limitations. 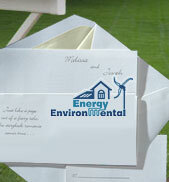 Under-sizing systems provides large energy savings as the smaller system will consume far less energy. However, the smaller systems will not be adequate to meet peak demands. As a solution, under-sized systems can be augmented by electric heating backup for the short periods of peak operation to meet load demands. Our models predict that operating undersized GHPs at partial load conditions with electric backup can reduce first costs by 27% and energy consumption by up to 15%. A geothermal ground loop can be coupled with a high mass radiant slab so that when the ground loop temperature is cooler than the floor temperature, the home can be passively cooled without the use of the GHP compressor. Direct heat exchange takes place between the ground loop and hydronic floor using a low energy circulation pump. Since compressors consume 73% of the energy of a GHP system, and circulation pumps only consume 11%, passive cooling provides significant energy savings. 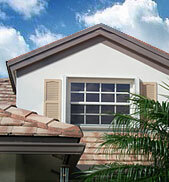 EEC has incorporated passive cooling into its platinum LEED home. Coupling a ground source heat exchanger with a high mass radiant floor system is efficient, cost effective, and easily integrated with other renewable systems such as solar hot water. At 3.5 times the thermal conductivity of air, water-based (hydronic) heating distribution is more efficient than forced air systems and can be directed more accurately with higher cost effectiveness than forced air heating. In addition, it provides point-of-use even heat and cooling distribution resulting in greater comfort. With advanced control and two stage compressors on water-to-water heat pumps, the total system efficiency (heat pump, distribution, and pumps) equals or exceeds that of water-air units. Hydronic radiant cooling with a reversible water-to-water GHP can be coupled with the hydronic radiant slab to provide hydronic cooling as well as heating. This avoids associated costs for a second water-to-air GHP unit and ductwork for forced air cooling. Heat absorbed by the floor is circulated to the GHP to simultaneously cool the home and produce hot water. Radiant floor cooling is excellent to dissipate direct solar heat gains from glazing and the sensible heat in the air. Dehumidification and minimal cooling via a small water-air cooling coil is used for latent heat removal. Radiant cooling is only applicable in semi arid climates where condensation potential can be avoided by incorporating a real time dew point sensor and controls. 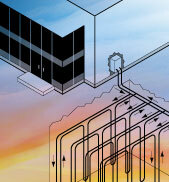 Radiant cooling extends the utility of ground source heat pumps while providing unparalleled user comfort. During the fall, solar hot water (SHW) production is high when heating loads are low. In a stand alone system, the size of the SHW collectors is limited to the size of the hot water storage tank. By coupling SHW collectors and a geothermal ground loop, excess heat can be redirected to the ground loop which acts as a thermal storage. This not only "pre-heats" the ground and helps improve the efficiency of the GHP as it begins to draw heat from the ground in the early heating season, but it also allows over-sizing of the solar hot water collectors which greatly increases hot water production during the cold winter months. In Colorado, heating loads are 40% greater than cooling loads, so ground loops are sized to meet the heating demand. As a result, the ground loop is oversized by 40% for cooling operation. In addition, excess heat from solar collectors can reduce the efficiency of GHP cooling during the summer because it increases the entering water temperature. By breaking up the ground loop into zones, the ground loop can be used simultaneously for cooling and thermal heat storage. EEC has incorporated a segmented ground loop in its technology demonstration home and for custom client applications so that heat is dumped to a zone consisting of 40% of the ground loop and does not affect the other 60% of the ground loop being utilized for cooling. A desuperheater is a small, auxiliary heat exchanger that uses superheated gases from the geothermal heat pump's compressor to heat water. When installed with a water-to-air GHP, a desuperheater can provide 13-15% of domestic hot water. EEC offers desuperheaters as an option to its customers for geothermal heat pump applications. Excess heat removed from a home by a GHP during the summer can be redirected to heat domestic hot water instead of the ground loop. Where cooling loads are larger than domestic hot water loads, active cooling creates heat without additional energy and essentially doubles the COP for hot water production. An alternative is to dump excess heat to a swimming pool. Using this method, EEC has implemented systems which have COPs that exceed 12.0. There are a variety of ground loop configurations such as length, pipe sizing, vertical, and horizontal that affect cost of installation and performance of a GHP. EEC models various scenarios to determine the best price performance when designing ground loops. For example, in one scenario, the cost of a vertical ground loop for a 4 ton GHP has increased costs of $2,200 but only provides an increase of 1% in the COP of the system. In this case, it is more cost effective to install a horizontal ground loop and sacrifice the 1% in performance. Thermally enhanced grouts provide improved thermal conductivity between the ground loop and surrounding soil. EEC's modeling indicates that improving the thermal conductivity by 25% improves the ground heat exchange efficiency by 11%. As a result, the size of the ground loop can be reduced providing cost savings on the installation while maintaining performance. EEC offers Copeland Intellistart™ single phase soft starter with every Waterfurnace geothermal heat pump. This reduces the normal start current by 70% and enables compressors to be started with much lower currents — typically 30% of normal starting amps. The benefits of this include a reduced light flicker and start up noise and an improvement of the compressors start up behavior. EEC uses GHPs with Comfort Alert® installed. Comfort Alert provides around the clock monitoring for common electrical problems, compressor defects and broad system faults. Real time monitoring by Comfort Alert allows easy analysis and repair by trained technicians in the event of technical problems. EEC offers permanent magnet software modulated pumps as an option which can provide significant energy savings and performance and maintain pressure or energy performance unattended. Circulation pumps consume 7% of the energy of a total GHP system and are utilized in solar hot water systems, hydronic heating, boiler operations, desuperheaters, and water-to-water GHPs. Staged solar heating uses a combination of controllers, temperature sensors, and two or more storage tanks to control water temperature and prevent overheating during summer months while still meeting hot water demands during winter months. Once the temperature reaches its peak in the first tank, cool water from a second will be exchanged with the first tank to reduce the temperature and heat the second tank. 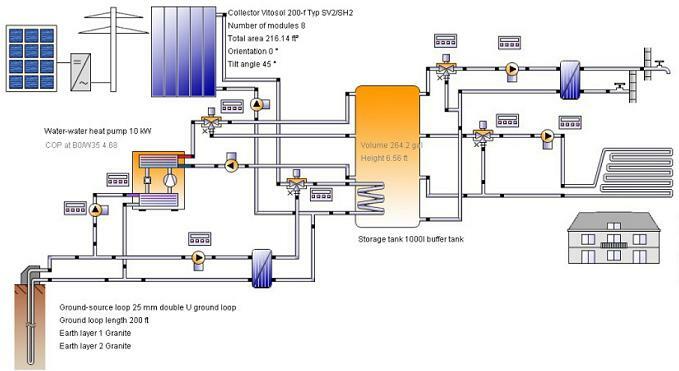 Alternatively, the system can be designed to direct excess heat to a thermal storage such as a ground loop. In addition, a dynamic temperature loop can circulate water through the collectors which is activated by a solar PV-controlled pump. This will provide an accurate measure of the collector temperatures and prevent the mixing of under temperature water in the storage tank. This is a common problem with typical systems and can bring down the temperature of water in the storage tank, reducing efficiency. Super heated water produced from solar hot water collectors can be directly applied to dishwashers and washing machines through a mixing valve installed under the sink. This avoids energy consuming electrical pre heating of water for these appliances, reducing their energy use by 50%. EEC integrated systems with solar hot water utilize advanced controllers to monitor tank temperatures and cool tanks at night to prevent overheating. Higher tilt angles for solar collectors reduce summer heat gains and maximize winter heating gains. Stratification simply means the natural separation and laying of water based on temperature in the storage tank. For highest efficiency, design should take care to not disrupt or mix the water layers in the storage tank. The hottest water should remain at the top, where it is available for supply and apart from the coldest water in the tank at the bottom. When hot water is drawn from the top of the tank, it is replaced by new cold water, which enters at the very bottom. Water circulating to the solar collector should be drawn from the bottom of the tank where water is cold to maximize efficiency of the solar collectors. EEC uses European proven designs to optimize system performance by modeling various stratification options. In general, the return on investment (ROI) of a tankless hot water heater is very low. However, smaller electric tankless heaters make sense to boost the SHW system when solar resources are insufficient. EEC has implemented this method to provide backup for SHW systems. Combined with staged solar design, EEC has implemented domestic hot water system efficiencies of over 80%, compared to the Colorado average of 65%. Coupling SHW with an energy recovery ventilator improves dehumidification efficiency over conventional systems. Electric heating is replaced with a water-to-air heat exchanger and supplied with water preheated by solar collectors. EEC has demonstrated this design in indoor pool and spa applications where solar hot water resources were available. Adequate air changes, humidity control, and filtration are critical for the health of occupants in tight building envelopes. EEC determines the optimal strategy to provide superior IAQ at the lowest installed cost. EEC incorporates oversized filters in return air ducts and energy recovery ventilators and uses MERV 8 filters. We install a differential pressure gauge on both sides of a filter to provide the owner a metric for when a filter change is required which is important as clogged filters can greatly degrade the efficiency of a system. Another alternative is to use a digital controller and infrared dew point sensor to monitor humidity and control a variable speed water-to-air GHP for humidity and ventilation. The figure below represents the system design for a low energy 2700 SF home. EEC’s design represents an innovative GHP-centered approach which combines space conditioning and water heating, thereby reducing annual energy consumption by 50% relative to today’s standard construction practices. This solution maintains uniform comfort, humidity control, and indoor air quality and is particularly suitable for the lower cooling loads expected in highly insulated low-energy homes. An energy recovery ventilator with HEPA filtration provides ventilation and filtration with minimal energy use,and Solar PV or wind is incorporated to provide power for the integrated HVAC systems. The solar hot water panels are oversized to provide 90% of hot water demand. A water-to-water GHP augments the solar hot water system when necessary to maintain a constant temperature in the hot water storage tanks. This can also be done with a water-to-air GHP with a desuperheater. These temperatures are monitored and controlled by set points on temperature sensors. Because the water is already pre heated by the energy from the sun, the GHP runs at partial loads, which uses 60% less energy than when running at peak loads. As a result, energy use is minimized while the efficiency of the heat pump is maximized. Furthermore, the excess heat produced by the oversized solar hot water panels during the summer months is redirected to the ground loop. This warms the ground and entering water temperature of the GHP which can increase the efficiency of the heat pump in the early heating season. Preheating the ground with solar is referred to as solar assisted GHP. Heat for the home is then distributed through a high mass radiant distribution system, which provides comfort while avoiding drafts and ductwork heat losses associated with forced air heating. The GHP is undersized relative to the heating/cooling load calculations for a building this size. This practice reduces first costs related to the ground loop, GHP capacity, flow centers, and pumps, and the smaller system consumes far less energy. An electric resistance heater in the duct (20kW in this example), provides backup heat during peak load heating conditions to ensure the occupants comfort level. The two figures below represent the integrated system design and plumbing design which was incorporated into a an existing 5,500 SF home in Parker, Colorado that used gas-forced heating and direct exchange cooling, a natural gas hot water tank, and inefficient air ducts for distribution. EEC modified the home to insulate and air seal the home to Model Energy Code 2006 standards, incorporated radiant floor heating from below the existing floor (staple up), radiant heating from above the second floor ceiling (staple down from attic), and replaced the air conditioning units with water-air GHPs and upgraded ductwork. The water-air GHPs are used for air conditioning only and are not connected to a ground loop. These GHPs utilize a virtual ground loop connected to a pool which receives the extracted heat from the home. A water-water GHP backs up the solar hot water array to provide 98% solar heating to the home and for domestic hot water. Modeling the simultaneous heating and cooling of the integrated GHP technology predicts a COP of 12.0. To put this into perspective, this is over twice the COP of a typical GHP system and ten times more efficient than a conventional HVAC system. Plumbing Diagram for Residential Retrofit of 5,500 SF home in Parker, Colorado with Photos of Actual Installed Components. 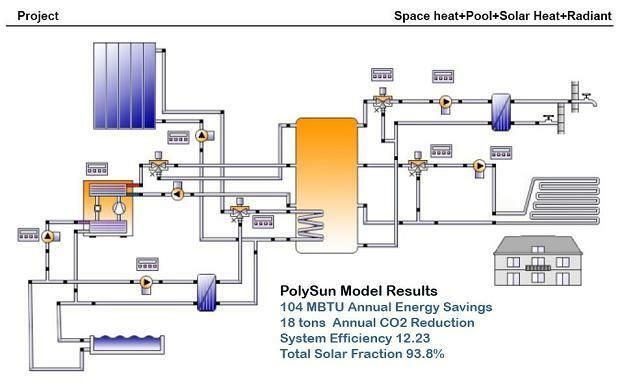 Solar Factor is 93% and provides 2.5 million BTUs of SHW per day for space heating. 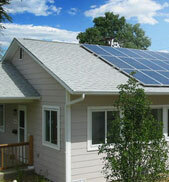 EEC has installed integrated systems in its demonstration home located in Centennial, Colorado. This house was the demonstration home for the 2008 and 2009 Energy Star Summits. The house incorporates our integrated GHP systems, is Energy Star and EPA Indoor Air Plus compliant, and will be certified by USGBC at the Platinum LEED level. The diagram below shows the system design for this home. The design combines solar hot water, geothermal heat pumps, radiant heating/cooling, and an ERV, powered with solar PV. Please visit www.platinumleedhome.com for more information and a detailed description of the integrated systems in this home. EEC's Platinum LEED Home Integrated Renewable Energy Systems Diagram. Visit www.platinumleedhome.com for more details.